While I am completely grateful that I can earn money in the way that I do I believe that working from home often gets a bit over glamourized and misunderstood. If you want to work from home here’s what to consider first. Potentially Earn More Money – The keyword here being potentially. Whether you’re going to make more money depends upon what kind of work you want to get into and how much you were previously earning. I was only earning a few dollars per hour over minimum wage so working from home seemed like a very realistic solution for me to earn more money. I wasn’t risking much. I knew that if things didn’t work out that I could go back to my old job. It takes time to find your sweet spot. If you’re currently a high income earner you might be a bit let down if you up and quit your job and expect to be earning the same amount right off the bat. Potentially Earn Passive Income – Working from home is NOT passive income. However, if you set up an online business you can certainly (eventually) build up passive income streams. For example, I earn money from ads from my own blog for work that I’ve previously done. I don’t have to be online to earn money since my blog is always online. It wasn’t easy though. It took tons of writing and a couple years, but now pays off. To earn (semi) passive income you have to have a plan invest a ton of work upfront. Increase Your Skillset – Every job I’ve taken has helped me grow in some way. When I first started online I worked for companies and professionals that knew WAY more about what they were doing than I did. So, I observed. I would take advice whenever given to me and I would pay attention to how to people I worked for ran their businesses and try to find a way to make those principles work for me. No matter what industry you’re trying to break into you can dramatically increase your skillset if you seek out opportunities from others who are doing what you want to be doing. Set Your Own Hours (Maybe) – Also, when it comes to online jobs there’s generally a good amount of flexibility. This is especially true if you’re freelancing or working on your own online business idea. Tons of Options – What I love the most is that there seems to be something for everyone! I make my money in three main ways but I went through five ideas before that. It’s not all rainbows and sunshine. From my point of view these are the biggest cons in getting started. Ton of Upfront Work – This is mostly in regards to an online business and not necessarily a typical work from home job. If you’re building a freelance business you’ll have to put in a lot of work to find your clients. When you’re selling something you’ll have to put in a ton of effort to find your customers. If you’re blogging you have to put in a ton of hours to get people to your site. In my experience most people vastly underestimate the amount of time it takes to get going. Inconsistent Pay – When you first get started it’s likely you’ll be dealing with inconsistent and possibly low pay. This is why I highly, HIGHLY recommend you don’t quit your day job and dive right in. Build something on the side and build your savings. This will help you get through the beginning time when income isn’t the best. MUST be Self-Motivated – With no boss hovering over your shoulder or giving you a to-do list you must be self-motivated. And trust me, when you’re working at home you’ll be more distracted than you think. Isolating – I am an introverted person so I thought working from home would really help me shine with productivity – and it did, for a while. But the more I’ve worked from the more isolated I’ve felt and realize that I do much better work when I’ve had some human interaction. This might not be a problem at all for you but it’s been a problem for me. VERY Hard to Work at Home with Young Kids – I get lots of emails from moms with young kids at home looking to find a work from home job or start an online business. That is going to be hard to do. Unless you’re willing to sacrifice sleep it’s going to be hard to work from home with kids. When my kids were younger and fully dependent on me I had to use a babysitter. Working from home is still work. If you’re still working for an employer only from home it’s not much different than working from an office. You may get the flexibility of setting your own schedule but you will still need to strictly adhere to the schedule. 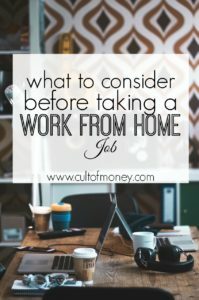 If you are freelancing (finding your own clients) or starting an online business you may find that working from home suits you well since you’re in control. This is especially true for highly motivated people. At the end of the day working from home is just like anything else – great for some and not so great for others. I’d recommend testing out a side job before fully committing to a work from home gig.